Samsung has quietly pushed out an update to the Samsung Flow apps on Windows 10 and Android with some noteworthy features. The update, which bumps the version number to 3.5.04 on Android and 3.5.10 on Windows 10, brings three new features according to the changelog: clipboard sharing between connected devices, drag and drop files in Smart View mode, and a new authentication method through biometrics on tablets. Undoubtedly, clipboard sharing is the most appealing part of this new update. Once the Samsung Flow app is updated to the latest version on both your phone and PC/tablet, a new clipboard icon appears on the top-right corner of the app’s home screen. Upon clicking the icon, a two-way clipboard sync (text only) is enabled between the connected devices. In our brief testing, the feature worked as advised, coming across as a compelling alternative to third-party solutions. The other important feature in the latest update is the ability to drag and drop files in Smart View mode. When mirroring your phone screen through the Samsung Flow app on Windows 10, you can now simply drag and drop files from your PC onto your phone screen to initiate a transfer. Last but not least, Samsung has also added the option to use biometrics on supported Galaxy tablets to sign-in to Samsung Flow. Previously, initiating a Samsung Flow connection from a tablet required authenticating the request on the phone every time either through Simple Unlock or Samsung Pass. However, Samsung is changing that in the latest update with an option to validate connection requests on the tablet itself. 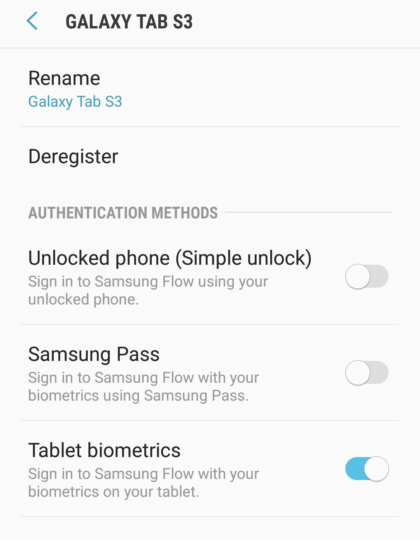 To enable this option, go to Manage Devices in the Samsung Flow settings menu on your Galaxy smartphone, click on the gear icon next to the registered tablet and toggle the ‘Tablet Biometrics’ option under Authentication Methods. Once that is done, you can initiate and authenticate Samsung Flow from the tablet itself using the biometric options, provided the app is already running on the phone. Samsung may be rolling out the app update in stages. If you haven’t received the update yet, you can download the APK from our APK archive.